Lingzhi mushroom (Ganoderma Lucidum) has been long used in traditional Chinese medicine for vitality and longevity. Today it is coveted for its many properties for enhancing general well-being. In recent years medical researchers have shown Lingzhi to be beneficial for promoting blood circulation and metabolism, improving memory, easing intesinal disorders, providing extra energy and strengthening the immune system. Lingzhi has also displayed promising positive effects on many chronic conditions. 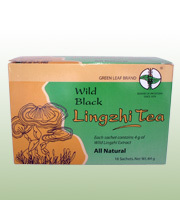 Wild Black Lingzhi. Each sachet contains 4g of wild balck lingzhi extract. Dissolve contents in 6 oz of hot or cold water. Add honey. Take 2-3 sachets daily if necessary.